Didn't search/replace the database when migrating? Didn't search/replace the database when migrating? When I migrated my site, I did not search/replace the database; what can I do now? This article is about “migrating” a site – that means, cloning it at a different location (URL). 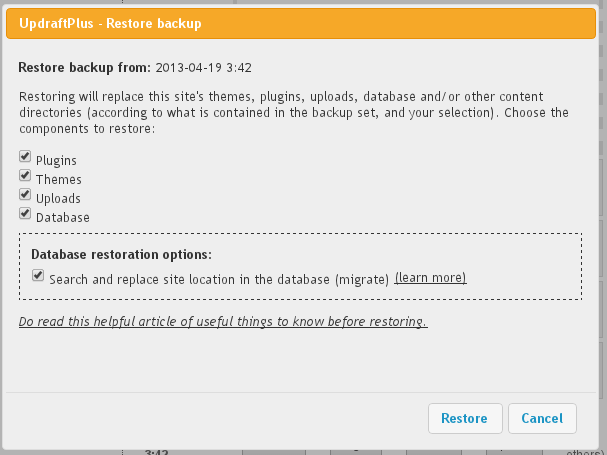 It does not apply to “restoring” a site – when the site’s location stays the same. In step 5 of the migration instructions, there is an important checkbox to tick. This performs the search/replace on the database, so that all the location references are updated. If this checkbox is not ticked, then you will not even be able to log in to your new website; WordPress will keep sending you back to the old one. Connect via FTP to your website (or whatever other method your web hosting company gives you to access the files stored in your webspace). Find the file in the root of your WordPress install called “wp-config.php”, and open it up to edit. Then save the newly edited wp-config.php file back to your webspace. Visit your site’s /wp-admin page (e.g. http://example.com/wp-admin) and now you should be able to log in. If the whole site has now crashed and you can’t even visit the admin page, then you must have introduced a typing mistake in step 1 – go back and try again! Perform the database migration again, and make sure that the box is ticked. There is no need (and it will only waste time) to re-migrate the plugins, themes, uploads, etc. Keep the browser window in which the operation takes place open, in case anything goes wrong – then you will want to copy and paste the contents so that they can be analysed.